Children often face issues with the shutters that have chords as they tend to get tangled and fall down. 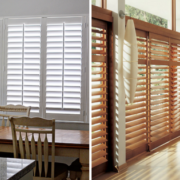 Choose plantation shutters which are easy to handle and are safe to be used in the home. Moreover, these are perfect when if you are fond of having plants in the home and do not want something with hard wires all round which can hurt if not maintained properly. You can even install custom made plantation shutters to give them your personal taste.